Larie Beasley, granddaughter of Bill and Kay Burrows, of Burrows Ranch Hunting Club, brought down this nice 165-pound Russian boar this past fall with a well-placed neck shot using a 7MM-08-Model 70 Winchester, and a 140-grain Nosler Partition bullet at 100 yards. Bill reports that they had taken 21 wild hogs up until that time for the season. 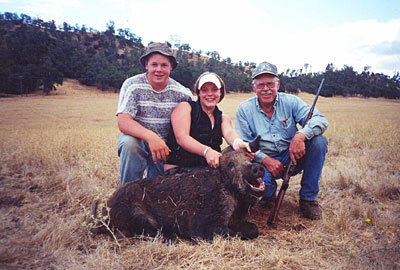 The hogs weighed from 117 pounds to 275 pounds, averaging 176 pounds. Pictured with Larie is brother, Beau Beasley, and Grandad, Bill Burrows. If you are interested in hunting on the Burrows Ranch, located west of Red Bluff, California, contact Bill Burrows at (530) 529-1535.